The summer has officially arrived. Along with it comes the heat. 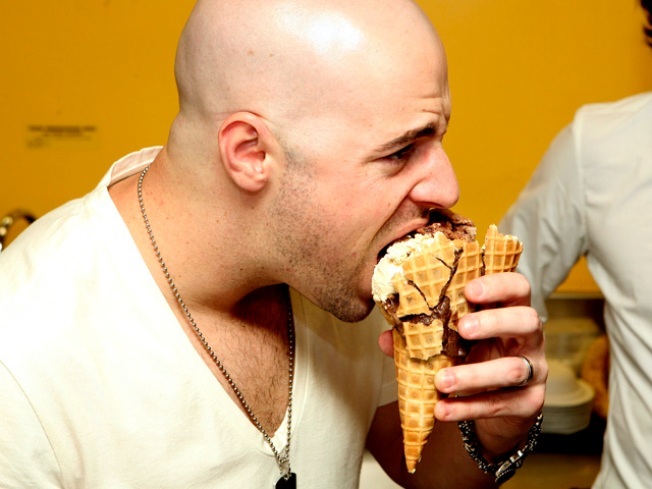 There is no better way to cool down than with a cup or cone of your favorite ice cream, like Chris Daughtry's doing here. It seems as if summer has finally shown up and soon enough, everyone will be looking for ways to beat the long overdue heat. A cheap and enjoyable way to do this is by grabbing a cone of your favorite flavor of ice cream. But we’re not just talking about any ice cream. The best ice cream in the state comes from local farmers who make it fresh and sell it fresh. These are the places that the locals know and hate to share because they already have to compete with their neighbors to get this treat. Often times, when you pull into the parking lot of these farm stores and see the line out the door, you would think that Britney Spears was signing autographs or Apple just released some new gadget that could save the world. People often times will wait upwards of an hour on a busy night or weekend, but to them the reward is well worth the wait. To add to that, there are some fanatics who will drive even further than an hour to get it. Each farm store also offers varieties of milk and fresh produce to purchase, but we all know it’s really all about the ice cream. The question in the end is, which is the best? But that is something you will have to decide on your own. Our best advice for you is to try them all and let us know which is your favorite. To save you some time, check out this map to see which is closest to you.